I’d like to think that I’d be able to stay the course and go all-in during a stock market downturn like everybody I meet on the internet, but I’d be lying to myself. Experiencing rapid losses in 2000 as a 23-year-old freaked me out. Therefore, I sold all my after-tax internet and tech stocks within two months after the downturn began because I was losing roughly $5,000 a week. In the end, I lost about 10% from the peak. If I hadn’t sold, I would have lost around 65% over a two year time period. What’s worse, I would have had to wait until Aug 1, 2013 to get back to even! Can you imagine sitting on dead money for 13 years? Between 2000 – 2013 I continued to max out my 401(k) and buy stocks. But I didn’t have the foresight to go all-in on August 1, 2002 when the NASDAQ bottomed. Instead, I mostly hoarded cash and bought 4.5% yielding CDs as I moved from NYC to San Francisco in 2001. The last people to join a company tend to be the first to let go. Seeing how violently stocks corrected between 2000 – 2002 made me gun shy to ever bet the farm again. Instead, I bought San Francisco property in 2003, 2005, 2007 (Tahoe, oops), and 2014 because it felt so much better to have a physical asset instead of a paper asset. After the financial crisis of 2008 – 2009, I again didn’t step up to the plate and buy large amounts of stock or property between 2008 – 2011. All I did was continue to max out my 401(k) and make sure I didn’t get laid off. I became disillusioned with the financial services industry and wanted out. Therefore, I ended up hoarding more cash to give me options just in case I decided to take a leap of faith, which I did. It wasn’t until August, 2012 that I bought 12X more stock than my normal cadence due to a severance windfall. I viewed my severance as the house’s money, so I figured why not risk it all and see if I could make more in the future. With my non-severance cash flow, I remained conservative. Despite feeling like we were out of the woods by 2014, I still couldn’t invest aggressively in the stock market. I was again fearful of losing money. Instead, I decided to buy a SF fixer in 2014 because it felt like there was some serious mispricing of SF ocean view property. But the other reason why I bought was because I wanted to reduce my housing expense by renting out my old place. After selling a SF rental home in the summer of 2017 in order to simplify life, I decided to invest ~$1.2M of the ~$1.8M net proceeds in stocks and bonds. I had already taken risk exposure down by $800,000 by getting rid of the mortgage. I told myself that my risk tolerance was being able to lose about 10% before worrying, so I invested in roughly 60% stocks / 40% municipal bonds. Everything had been going pretty well since August 2017 when I first opened up the account. Then February and March 2018 beat me up. 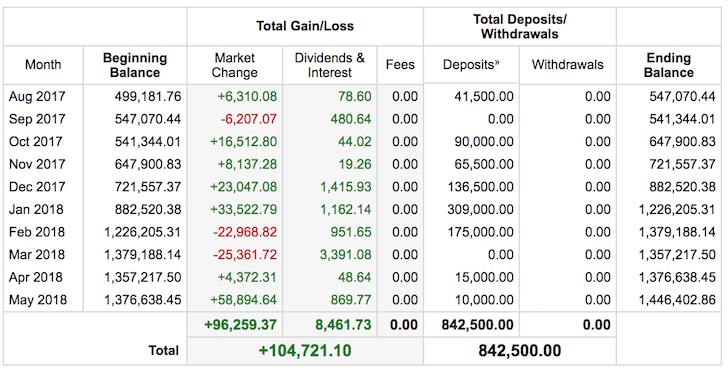 Even though I “only” lost $22,968.82 in February and $25,361.72 in March (-1.7%), there was a time in February where I was down around $50,000 (-3.4%). That’s when I started to feel uncomfortable. February was a month that had a violent drop and then recovery. But March ended the month at a low. See the chart below. Losing $50,000 in a couple weeks in just one out of eight investment accounts I track on Personal Capital made me seriously reassess my risk tolerance. When I was down $50,000, I became demotivated to do any work. For example, being offered $1,000 to sponsor a podcast episode just made me depressed because it let me know I’d have to put in serious hours to recoup all my losses. I also wanted to start spending money on something before the stock market took all my capital away. Heck, $50,000 could pay for a year’s worth of college tuition or really help the foster center I was volunteering at. Overall, my mood soured as I cursed myself for taking on excess risk I didn’t need. Things had been going so great in December 2017 and January 2018. I should have sold in January when the market started going parabolic, but I didn’t because I was greedy. I also started to regret selling my former home, despite all the maintenance and tenant headaches. The only positive this year is that I invested another $175,000 in the market in February to take advantage of the sell-off. But I invested $0 in March because I was too scared of what the future might hold. Then I looked over to my real estate crowdfunding account where I had invested $550,000 of my house sale proceeds. Ah, no change in principle with modest earnings to date. No movement in the Total Capital Invested is also an illusion. But it felt so nice in comparison, even though the real figure to focus on is the Capital Returned portion of my 14 equity investments. But that will have to wait for several more years. What I realized after reviewing my REC dashboard is that I really don’t like volatility. It’s nice to see my stock and bond account go up, but the feeling of loss is at least 2X worse than the feeling of joy when I make money. Instead, I’d much rather have a very stable capital account with a monthly dividend payment so I can focus on writing and spending time with family. Here’s hoping my real estate crowdfunded investments do indeed return 10% – 15% a year for five years. Look, I know it’s easy to feel like an investing guru in a bull market. Especially if you only started investing a significant amount of capital since the financial crisis. But trust me when I tell you that your confidence to “stay the course” and “buy when there’s blood on the streets” is misguided. When there is blood on the streets, you will be worried about losing your job or your customers. If you have leverage due to a mortgage, your equity will get zapped away. You will logically go into survival mode and start preserving capital to protect yourself from misfortune. During a recession, maxing out your 401(k) or IRA, pre-tax retirement accounts you can’t touch without a penalty until 59.5 is easy. This is where everybody needs to stay the course. It’s taking a step beyond and risking significant amounts of capital in your after-tax investment accounts when the markets are going down every day that is extremely hard. Maybe everything is relative, and those telling me to “stay the course” are simply maxing out their 401(k)’s to the tune of $18,500 a year and not referring to investing multiple times extra in after-tax investment accounts. No matter. Right now, I fear having to go back to work full-time to provide for my family more than anything else. Here are some questions you should ask yourself to discover your risk tolerance. * What percentage of your annual salary or annual expenses are you willing to lose before you start getting extremely uncomfortable? My answer: six months worth of expenses. * How much longer are you willing to work to make up for any large losses? My answer: three months. * How much time are you willing to spend away from your family? My answer: no more than three days a year for the first five years. * Have you been laid off before? If so, chances are higher than average you will be laid off again during the next recession. My answer: yes, but on my terms with a severance. * How much in after-tax capital did you put to work during the 2000 and 2008 financial meltdowns? My answer: not much at all besides maxing out my 401(k). * Did your losses in 2008-2009 equate to more than a year’s salary? My answer: yes, many years worth. * If you lose your job and 40% of your investable assets, do you have enough liquidity and alternative income streams to hold you over for at least a year? My answer: yes, although my alternative income streams will likely decline. * Does your mood tend to follow the market’s ups and downs? My answer: there is a stronger correlation on the downside. * Do you confuse brains with a bull market? My answer: all the time. Whatever you think your risk tolerance is, take it down by 50% and that is more likely your real risk tolerance. Being overly confident is extremely dangerous when it comes to investing. 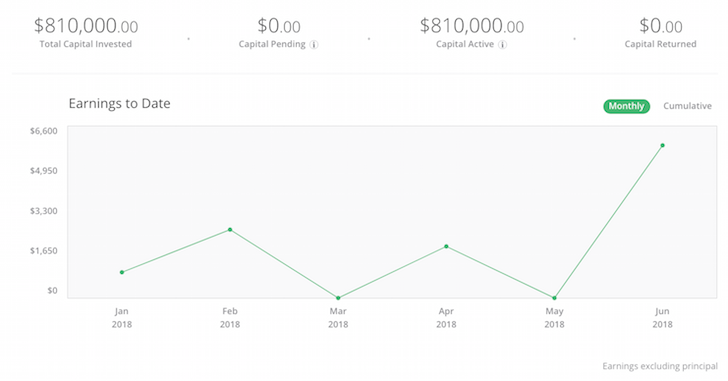 Track Your Investments In One Place: Sign up for Personal Capital, the web’s #1 free wealth management tool to get a better handle on your finances. Their award-winning Investment Checkup tool gives you a fantastic overview of your risk-exposure. 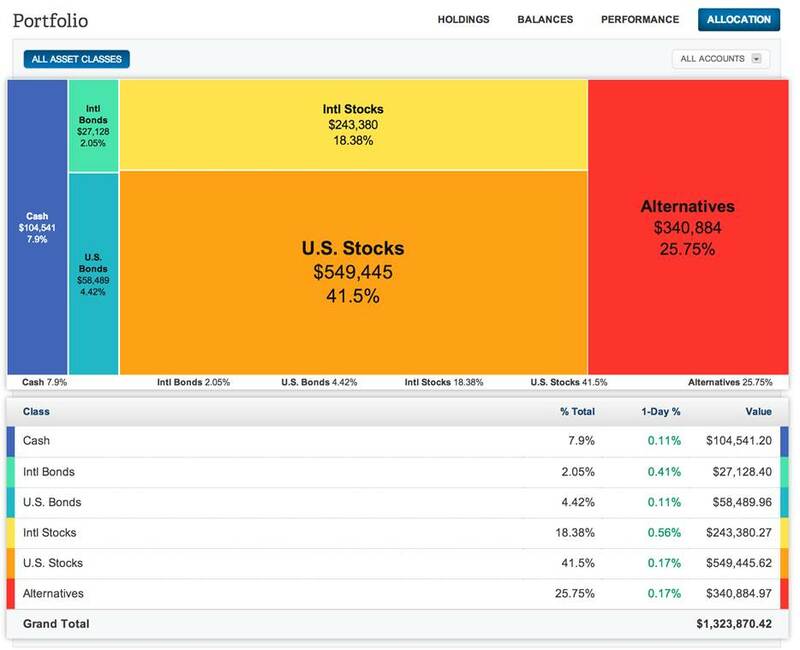 From there, it’s much easier to see where you need to add and reduce positions to better manage your investments. Because I have eight different portfolios, I often times underestimate how large my positions are until Personal Capital gives me an overview. No one has pointed this out. What are your thoughts? Very few people could stand that kind of drop. I was one of them – moved ~50% of our portfolio to bonds and didn’t switch back to stocks until 2010? Later my friend, a hedge fund manager told me something similar to Taleb’s Barbell Strategy (although he didn’t know at that time): keep a few years living expense in cash, the rest in S&P. During the downturn, he didn’t switch to bond, instead he switched some of his weak stocks to strong stocks that got punished unduly and stayed invested. Since then we’ve been maintaining a similar strategy: we have real-estate portfolio that generate positive cash flow that can supply our basis need (like tax, food, transportation, etc..) and if we cut out trips to exotic locations or expensive restaurants, etc.. plus a few months worth of cash. The rest we keep 100% in S&P. The plan is never to touch S&P and can reap the long term benefits (~8% yoy w/ dividend-reinvest). We don’t know how this would work out in the next crash, but will keep adding to cash from now on since we’re quite nervous too. Sam, you just gotta chill out and ride the waves. at the end of the day it’s only money. health and family are worth much more. If a loved one gets sick, has cancer or Alzheimier’s, all the money won’t help much. You haven’t actually lost money until you sell your entire position and cash out. If you are that worried just liquidate everything and buy 2% gov bonds. About time and money, if someone offered to give you 10 extra years of life in exchange for all your money now would you do it? You’re absolutely right. It’s just money, which is why I decided to leave work at 34 and enjoy life. It’s been so awesome, especially now that I have a baby boy 10 care of. It’s a great blessing. At what age did you decide to do your own thing? What’s your background? I’ve got a business degree and did marketing and finance work. Then had enough and started doing things I like and not chasing jobs with bigger income. I’m Chinese as well, raised in North America. Parents 1st gen immigrants. Asian culture seems to be too fixated on money and not emotional well-being. See it alot in my city, kids driving Ferraris, top end BMW’s Mercs. Dad made all the money in China. It wouldn’t turn out well when they grow up. I’m around your age and decided a decade ago to stop worrying. Could have stayed in my cushy government job with pension but life is too short for that. Cool. So what is it that you do now? Let’s just say I get to travel and live on my clients’ expense in interesting countries. All because I speak English and Mandarin and they need it. There is a huge interest in Chinese now, you got Mark Zuckerberg and tons of foreigners learning because they see China as the next big global market. How’s your putonghua these days? You could probably live like a king if you move to Shenzhen or that area. San Franc’s too nice to give up though I get it. What are the money-making options of being bilingual, other than being an English teacher in China? I also know Chinese reasonably well. I have a PhD in Electrical Engineering, and have been a hedge fund manager for my own fund. Would like to know what the money making opportunities in Shenzhen as well. Am I right in thinking that for you, losing money feels like something that potentially might not recover? And feels not as a % but a scary $ amount?. I perhaps shouldn’t but try to maintain a faith in the markets that has made it easier, I fear inflation more than volatility because I’m young, I have a long time horizon to wait things out, hopefully the discipline. I hope to attain security by growing beyond what I could ever need rather than protecting what I have. Nice to hear from you. My biggest fear is Losing time, which is the result of losing money. I know there’s a great chance I’ll recover from a correction, but it takes time. Now that I’m older, I really don’t want to wait 10 years to get back to even like many did in 2000. That will determine your acceptable risk tolerance. Short term: Lower risk/volatility, Time is against you. Long term: Higher risk/volatility, Time is on your side. Example: If an asset such as a 401K is needed in 20+ years, then the risk tolerance should be high. If the market corrects, the sky is not falling since time is on your side to weather the downturn. As you get closer to your sell date, reduce the risk/volatility with more stable assets. Hi Sam, long time reader, big time fan, and first time posting. in your opinion, what is the safest short to mid term asset to park investments right now? My situation is that i have 70% of my net worth becoming cash in next 6 months, due to business sale. Will need to put that cash to work, because i do want to retire early, but of course worried about possible down-cycle. thanks and congrats on a high quality blog! Safest would be an online FDIC-insured money market account paying a high yield. You can just park the money in a CIT Bank money market account or short-term CD for example. I started off on a similar path Samurai. I invested in blue chip stocks when I was in my early 20’s based on expert/friends opinions. I knew I was going to be a millionaire, so I did with with all the confidence in the world. 12 years later, I was still down 40% and eventually sold them all for a good loss. Now, a few years on, I spread the risk between investment properties, indexed funds & a few side gigs. We are never out of the eye of risk but we can only protect as much as we can. I have massive tolerance for risk and would not be affected much even if i were lose 50% or more. I went through 2 recessions, 2001 and 2008. I lost a 90% of my money and vowed never to invest again. But then I saw the recovery and decided to wait for the next recession. My wife and I started 401k in 2009. I bought my primary home and investment properties in silicon valley from 2009 to 2013. I have stopped making any additional investments (except for full 401ks) since 2017 and have been concentrating on paying down debt. Have also lined up 500k line of credit in case there is a recession and market tanks. This coming recession I will be going all in, guns blazing… I hope I am able to muster the courage to do it like I did in 2009! Separating your own money into house money and your truly yours money seems l me an illusion too. Also, reallocating your assets to safer bonds, CDs or even cash and gold is actually a lot easier to do in a 401k because there are no tax implications. If I want to rebalance I always first try to do a total asset rebalancing by doing as many transactions as I can inside my 401k. Outside the 401k a lot of other considerations, mostly taxes, come to play. Especially when you are already stressed out due to a quickly moving downturn or are experiencing FOMO anxiety in a quick upturn, the complication of taxes is the last additional thing you want to think about. I’m not that afraid of losing 30% even if I have to wait for a decade to recover (I can say that having battle tested myself in 2000 and 2008 where I was down 1M — and already out of the workforce since the early 2000s. What I’m afraid of is the -30% being just the first installment of the black swan event where assets disappear to never recover again, as in prewar Europe or early 90s Japan. THAT is what makes you think of selling at a -30% loss, not the red numbers in parentheses on your monthly statement. At the end of the probability tail that wolf will one day come. Americans seem to have never experienced it so they are a little naive about it. Think of how you would feel if all your assets were in a defaulting bond where you got paid 45% after the bankruptcy haircut. That to me is the ultimate test of your risk tolerance. And somewhere at the end of the probability tail this event DOES exist — even for Americans. In the thirties Germany was a civilized country. And many of my ancestors thought “have faith, things can only get this bad, we’ll bounce back…”. They are not here to tell us about the losing end of that hopeful confidence. Self righteous pitchforks can get nasty. Really nasty. In the financial world, as voters keep voting themselves ever more goodies from the common tax trough, a runaway bankruptcy is not out of the question. In that scenario, investors (i.e. people who engaged in delayed gratification in exchange for a promise written on a piece of paper (stock, bond etc) will be the easiest targets (ducks sitting on a piece of paper) for the once goodie voting citizens (the very instigators of the crisis) now turned angry pitchforkers. Sometimes things turn out really unfair, and one has to keep an eye on the horizon. Most are just storm clouds, but once in a while they’re the harbinger of a category five hurricane. Well said. How are you investing your money and spending your money at this time? Given you’ve had a long history already, how do you figure out how much to spend and how much to leave behind? Is it hard to spend down your funds? I don’t try to time the market. My only deviation from looking at the stock market as a random process is long term economic growth. National economic growth is the wellspring of all gains. And looking at the past few decades the US is no longer a growth leader in the world (the growth trendline is just about half the world average ) and Europe is the slowest growing continent on earth. For most of its history the US had a growth rate much higher than the world average — and that is how Americans climbed to the top of the worldwide prosperity rankings (there is no other way, really). That is no longer the case. Total human growth has picked up pace in the last three decades and the US has not kept up, with US growth trendlines now being close to half the world average. Europe is even worse, and thus in an even faster decline. I think that the US government has grown too big, consuming close to 40% of GDP, approaching European levels, and so economic growth is closer to the dismal European levels, way below world average, and thus an arithmetically deterministic path to decline, as compounding dictates (I don’t feel I have to explain that in investing circles). I don’t see that trend reversing any time soon in the developed democracies, as voters seem to be addicted and essentially deadlocked into voting themselves ever more goodies from the common tax trough, and Europe quickly fading away on the world stage in two-three more decades, the US following with some delay. With a growth rate below world average, nothing is sustainable — nothing. Because I don’t try to time the market all my moves tend to be slow and time averaged. I’m now gradually moving away from stocks and investing in real estate, but not in highly leveraged coastal areas. I prefer areas where valuations are not more than 2x construction costs. That is where US real estate is really cheap by world standards. I’m also investing a bit into countries with strong economic growth. As risky and as susceptible to immediate crashes these markets may be, I think they will still provide superior long term results, by virtue of their faster economic growth and the relative stagnation of advanced democracies. I’m 10% into diversified emerging markets and slowly increasing. I’m not sure at what percentage I’ll start feeling uncomfortable. Strong dollar and uncertainty may indicate a good (cheaper) time to buy, or be the harbinger of a deep impending trough, and who knows maybe a spectacular recovery in ten years. As I said, I don’t time the markets, I just look at long term trends because my investing approach is now turning intergenerational. I see my investments through the eyes and life expectancies of my children. BTW, a related question. Do you think that the first person to live five centuries through fundamental genetic in-vivo interventions is already alive? That would change some investment considerations and strategies, wouldn’t it? Forgot the remainder of your question: I’ll leave behind as much as I can without having to go back to work, though there have been years where through consulting arrangements I got suckered back to work. I eventually slap myself in the face and quit again. Second, my funds and real estate have had a pretty good long term averaged run, but that only because the veal black swan has not come yet. Will it come? When? Who knows? It’s good to keep it in mind as a possible scenario but you cannot live in fear. (*)BTW, I have many friends, some very competent and smart who also feel the same decreasing marginal utility of money past the 90k/year expense point. We could actually form a 90k club. They too called it quits when they hit the safe 90k mark. And that is why it is very hard to keep competent people employed. There are many-many people out there who could have gotten to 300k annual W2 earnings, yet when that is combined with taxes (and the threat of estate taxes) they just called it quits early. The lost economic vitality is enormous, and in my view one of the main reasons behind the subpar performance of the US growth rate compared to the world average. In Europe they don’t even get to that stage as significantly higher taxes and more free unconditional services at the bottom of the income scale create such a flat effort-reward curve that most Europeans stay with mediocre ambitions at a daily job and never get to a position of being financially independent, in spite of being better educated than most of their American counterparts. Indeed, in that flatter effort/reward European environment that is a rational approach at the personal level. I’m a quant. I look at my portfolio as a single aggregate asset with a single risk and a single reward. I’m widely diversified in non correlated assets but most equities regardless ALL point into the ground in a bear. The correlations all tend toward 1. My solution is to run my portfolio on the efficient frontier and to run my risk at 2/3 of the SPY risk, and let the return be what the return will be. In 2008 SPY went down 50% and I went down 32%. I was even by 2011 and spy was even by 2013. By 2013 I was 15% ahead. I’m not maximizing my return but compounding my return. That 15% was earning me compounding while SPY was sucking wind. Do that 5 times on the way to retirement and you’ll do fine. I started investing the year Vanguard was born so I’ve seen a lot more than 2 downturns. I’m also a fan of rebalancing as a means of risk management. Rebalancing forces you to sell high and buy low. Owning shares you bought low is what makes you wealthy. You can do all the fast money moves you want but in the end it’s time time time and methodical attention to detail that wins. If you’re on the efficient frontier and about 2/3 volatility you will not have paid too much risk for the tiny bit more return a more risky or inefficient portfolio provides. I went through the tech dump and the 08/09 crash and held on, and kept reinvesting dividends all the way as usual. I more than made up the losses of those short periods of time. In 2009 my partner said to me “shouldn’t you think about selling up?” and my reply at the time. “I’ll sell up when you and all your friends stop spending your money!” It did feel uncomfortable at the time to be losing value. We all spend our money in the economy and those of us who are invested in the economy benefit. If you sell out and only invest in government bonds you are not really part of the economy. Can you elaborate why buying corporate and government bonds makes you not part of the economy? Governments issue bonds to build infrastructure and other things. Corporations issue stock or bonds to run their business, depending on which capital structure they think is best. I’d say governments borrow money to build infrastructure because they have already spent the tax revenue — and because citizens keep voting themselves goodies from the common tax trough, so the infrastructure must be paid with borrowing. And that may one day precipitate a developed democracy crisis that will make the last crisis look like a walk in the park. Over the past 25 years or so of investing I’ve never really rated government bonds as a lucrative bet. Sure I hold some cash for emergencies etc but my investments are mostly in the stock market. Also, the dividends that they produce are the important thing not the stock value. I don’t feel the fear that everyone else is supposed to feel when the stock market dumps. Maybe bonds are for those who can’t take the roller coaster ride? Even during recessions everyone around me seems to carry on spending so as long as they do that I’ll carry on investing in companies. Sam: Thanks for this post. In ’08-’09, self-employed with erratic income, at that time 50 years old, three small children, spouse not working, relatively large home mortgage in proportion to my income and assets, high cost of living area, in hindsight overallocated to equities and too concentrated in financials, I took a major hit to my retirement portfolio, which wasn’t all that big to begin with, as I started late. It just so happens right in March ’09 I also lucked out and something I had been working on in my business for two-three years came into fruition and I collected a substantial (for me) fee basically equaling my portfolio losses in one shot. Running all the numbers, blood running in the streets, etc., I knew intellectually/Warren Buffet says…etc. etc. that was the perfect time to pour it all into the stock market. Perfect opportunity of a lifetime. HOWEVER–under my then life circumstances I simply emotionally didn’t feel I could take any stock market risk with the windfall. Although I felt sure there was probably a 95% positive chance it would work out very well to invest it all in equities at the bottom, still, that 5% chance the market was doing a “headfake” and might go even lower prevented me from doing the “rational” thing. I felt confident that sure in 5 or 10 years certainly everything would be fine. But my immediate concern was having enough of a cash cushion for the next 2,3,4 years that I wouldn’t need to downshift my lifestyle–conservative enough as it was anyway–or that of my family in my childrens’ formative years. I kept the windfall in cash for about a year until I started reinvesting (and after that maintained a very conservative 50/50 ish portfolio between stocks/cash & bonds). I simply didn’t want to put my family in the position of me being wrong, stock market doesn’t rebound for a few years, having erratic cash flow due to my work situation, and quite possibly having to sell the house at the worst possible time to be doing that, and move everyone into a crap rental. Obviously I was mentally worst-case scenarioing it all and my mood was clearly very negative due to what was going on in the financial markets and all the uncertainty. Yes there was blood in the streets, plenty of it was my own, and unlike Baron Rothschild I didn’t have the stomach for any more to pour into the streets. Not right then, anyway. Thank you for sharing your experience. I can totally empathize as a father now who just wants to take care of this family. Once you have kids, if you’re a normal human being, it’s the well-being of your children and your spouse that matters the most. If it’s only you to take care of, it’s so much easier to take so much risk. I don’t care as much because I’ll just work harder to make up for my losses. But when my time is taken up by my kids, there is no way in hell that I will give up my time for money instead of to be with them. I know that life does not get much better after a certain income or net worth. I know this so clearly I wish other people would make The amount or have the amount where they think they will be so happy. So they can see for themselves. With a 50/50 portfolio, I’m sure you’ve never quite well! You’ve mentioned that you bought property in 2004,07 (amongst other years) but we’re gun shy to invest much during 2010. Given the property purchases left you highly leveraged do you think that was a contributing factor in not buying into the stock market pullbacks of 2008-10? Alex, good point and you are correct. I would say leverage and uncertainty of employment during the downturn’s accounted for about 60% of me being conservative in stocks. The other 40% was simply disliking stocks because of the volatility and disappearing act. At least with real estate, even if you lost 100% of your equity, and he still had shelter. With Stocks, I always just felt like I was being robbed when the stock would go down. How about you? You nailed it 100% totally agree. Everyone over estimates their risk tolerance unless their portfolio is so high no worries. Great post Sam. Long time reader, first time commenter. I’ve been thinking about my true risk tolerance quite a bit lately as I expect we are near the top of the market. I was just starting college in 2008-2009 and didn’t have any capital invested to lose so I’m sure I don’t have a real grasp of my risk tolerance. At this point I think FOMO is driving my investment strategy. I thought we were near the top of the market a year ago as well and would have missed out on ~25% return if I got out of equities. If we had a major market correction tomorrow I doubt it would crash >30%. Thinking of this, I’m just as afraid of poor timing as a market correction. I’m curious, a while back you wrote a great post on investment ideas at the top of the market (https://www.financialsamurai.com/investment-ideas-at-the-top-of-the-market/). Do you still consider these strategies as well? I invested in a couple structured notes since then with downside protection. The most recent one was a iSTOXX Europe Economic Growth Select 50 Index with uncapped upside, 150% of the upside, and 90% principal protection. Note is two years. I’ve continuously invested in the market, but I do want downside protection. Remember that in some cases even AIG crashes. This is why it is so so important to mentally prepare beforehand. I find that reading about market crashes, re-visiting news articles from the time, watching television coverage from the time, and reading stories from others who went through the time to be valuable. At the end of the day, investing is entirely mental. People like to chase gains and make investing hard, but sound investing (i.e. some % split between an equity index and a bond index) is easy. The hard part is the mental game. Once you can conquer your emotions, you’re fine. Hopefully you can conquer them before you learn the hard way. YOUR ONE GREAT FATHER. Happy Fathers Day. Thanks for all you do, putting your thoughts and fears and emotions into words. And thanks to all who comment. Give that youngin’ a hug from Nana. Hang in there, and thanks for the advice and being vulnerable in a world of hard knocks. Sam, as a 50+ year old, what do I do to prepare for a real estate downturn in the next two years? Keep my rentals, which are geared towards the lower end/college crowd? Reduce leverage is the key. It will help cashflow in a downturn event and allow you to leverage into more real estate as an option. So, pay off any mortgages on rentals? Losing 10% is nothing. There will be times when the stock market will lose a LOT more than that. 50-60% is certainly possible. Losses off 30% somewhere in time are a near certainty. You need to be mentally prepared for this as it will happen at some point. Easier said than done of course, the uncertainty is the biggest problem when investing in stocks. If it was easy everyone would be doing it. You really need to have faith and be optimistic, even during the darkest times when everyone is panicking. I think very few people have the right mindset and personality to deal with this. If you plan to be almost fully invested in the market and we understand that it is difficult to time the market, then why not implementing a strategy that at least you get paid when the market goes down to offset some of the losses you will have. That at least smooth out the volatility of the P/L of your portfolio. The point is hope is not a viable strategy and hoping the market will eventually come back up after it has corrected is not a strategy a responsible money manager should adopt. We are all money managers of our own portfolios. I wouldn’t call it hope. Just the conviction that the US and the world as a whole will continue to improve. And that the stock market will be a lot higher 20 years from now. This optimism has worked very well over the last 150 years with an inflation adjusted return of over 5% per year for stocks. But it will be a bumpy ride for sure. To smooth out the volatility I would use bonds. I’m not really into sophisticated techniques. They usually take a lot more time and add more complexity which I don’t like. Just a simple buy and hold stock/bond portfolio for me. Somehow you are still playing it safe in the market. You had a starting balance of 500k in August 2017. You’ve deposited 842,500. That’s a negative return or close to 0. You put a tremendous amount in from 2017 til now missing the earlier post bush era gains. The power of words is incredible. Above Average Black thinks you lost money overall despite the chart. Well done. Almost like a magician actually. Looking at the chart now. I see that you made money. Maybe I saw something different earlier. It’s cool. Readers and commenters tend to read what they want to read and express their views regardless of what I write. I’ve been investing since 1997. This account in my post is one of 8 public investment accounts. But I do know word magic. It does require some forms of active investing strategy as opposed to passive investing. The entire discussion would be very lengthy and likely is outside the scope of this forum. The strategy would require the applications of derivatives like options such as short calls/covered calls and/or long puts to hedge against the downside risks. Back-tests show that the strategy would help reduce the P/L’s standard deviation of the portfolio. Interesting. Where are you in your financial journey and how is your portfolio structured now? Right now, because of time, I can only actively manage my portfolio on that I have to pay capital gain taxes and I only leave my 401K and IRA portfolios without hedging. I know I am leaving plenty of money on the table regarding my 401K/IRA portfolios without executing my active strategy. I will likely use some kind of dividend plus covered call strategy and/or a variation of synthetic equivalents to manage my IRA portfolios after I retire. For my taxable account that has over 130 diversified positions, I don’t own that many stocks. For the most part, I have synthetic longs and shorts positions. For those few stocks that I own, I am using dividends and covered calls to reduce my cost bases. Do I have a sufficiently large cash reserve to confidently optimize its optionality in a recession? Planning to have $350k by end of 2018 and $500k by end of 2019. Will I have skill in the asset classes that crash hardest? Not under my control – if crypto currency is on sale I will miss it. I am hoping HY bonds, HY loans and Income property crash because this is where my deepest experience is. My portfolio goes up and down by hundreds of thousands a day. If I didn’t diversify out from a concentrated position, it would be going up and down by millions a day. I am emotionless towards it now. I sat on one holding through an 85% decline during the financial crisis, after which it bounced around the post-crash price for 7 years, and then held it all the way up to today after it went up 4000% from the bottom the past few years. That’s the kind of crap a stock investor needs to be able to stomach. The volatility should be easier to weather for index ETF holders, but people have been conditioned to believe that the stock market always comes back, and relatively quickly. I’m not so sure it will the next time (the government already pulled out all the stops the last time). I guess my outlook begs the question why I don’t just pull out everything now, but it’s capital gains taxes holding me back. What you have done wrong is investing in the market with the hope that the market would do up but without a contingency plan to mitigated the risks when the trend did not go your way. It is the fallacy of most stock investors. Maybe you investment mindset and psychology might have been conditioned by the forever uptrend of the San Francisco real estate market without you even being aware of it. What contingency plans do you suggest I add? I thought I had some contingency plans, but maybe I have overestimated these plans. What is your situation and where are you on your financial journey? One may want to double check the amount of time it takes to transfer funds between accounts. As well, perhaps double check the SIPC, and FDIC insurance amounts per account. During the GFC, FDIC insurance almost went bust. So mattress money might want to be enough to cover short term food & Rx bills. Psychologically it’s a lot harder to stomach losses than being happy about gains. I’m trying to buy into ETFs and index funds on dips, but when it starts dropped hard and fast I’m not sure how I’ll react. I try to follow Mr. Buffett’s rule to buy low sell high, and not put emotions into the equation. My risk tolerance on paper is high, but a major downturn would have to happen to see how I really handle it. During the Great Recession, my after-tax portfolio wasn’t much of a factor and I guess I was seeing the glass as half full when buying cheap into my 401k. Gah! Page crashed and deleted my comment. Long story short: Started investing in 2011, years of easy returns makes my risk tolerance high (losing paper gains with many years to recover just doesn’t bother me), but reading FS encouraged me to build a cash position to avoid a liquidity crunch since I now recognize my tendency to want to put every last dollar to work could get me in trouble. I think a lot depends on your personal perspective. It often amazes me how indifferent most people are with regard to volatility in the highly leveraged real estate market, but freak out as soon as their much smaller stock portfolio takes a 10% dip. That is not a judgment, just something I don’t really understand. I can imagine it has something to do with the fact, that with stocks you can look at the numbers basically every second, with a house it’s much easier to convince yourself that the current downturn does not affect you, because your house has yellow paint instead of white, so it doesn’t really compare to the one next door recently sold with a 30% loss. I would consider it a funny sociological experiment to put a gigantic priceboard in some neighourhood at which the value of each house is recalculated and pubicly displayed any time a transaction takes place. Probably house owners would consider it a lot less fun. I am 28 right now and started investing only in 2010 and so far it has mostly been in stocks. I view this portfolio more like a “synthetic business” and have a spreadsheet where I calculate a synthetic balance sheet and income statement and this is the aspect I focus on. The goal is to create a strong diversified business with a rock-solid balance sheet, good returns on capital etc. I only buy when I see a sufficient risk premium vs the risk-free return, that is why since early Februray 2016 there have not been any transactions, only cash piling up. I try to improve this business on a continous basis. So far my emotions have quite much behaved as I predicted in the beginning. I was very excited about all the cheap options in 2010-13 and bought as much as I could afford. I continued buying in 2014-16 but at a much slower pace as valuations grew and it became harder and harder to find good deals. So I have been waiting for two and a half years now. I guess my yields have been slightly subdued vs the overall market due to the growing cash portion, but I like the idea to have cash to start buying again when things get cheaper. I didn’t have money to invest in 2000. During 2008/2009, I lost 60% of my net worth, mostly individual stocks. I didn’t sell any. I thought it was normal. I kept maxing out my 401k and ESPP all the way. Kept all my vested RSUs, diversified into index funds and ETF. Didn’t sell any of them until I needed to pay a large sum for down payment of my new house in 2014, paid hefty capital gain which was very painful. I don’t see I’m going to upgrade to a bigger house anytime soon so I have been pouring everything into equity both 401k and taxable accounts. I have 18 months living expense in cash, 25 months expense in CA muni bonds. My rental generates cash flow enough to cover my house’s property tax, the dividend from my stocks/funds covers the mortgage so I would stretch even longer. With that said, I am prepared to ride it out in the next crash. I will surely be nervous if it lasts more than 43 months. If it does last that long, I might have something more sinister to worry about. Having a strong W2 is very helpful during the years. I don’t expect it in the next year or two, in fact I could be shown the door anytime. I’m counting on my cash and muni bonds to save me during the next crash. Out of curiosity, what did you invest in that made you take such losses? I invest in a portfolio of blue chip dividend growth stocks and I never took a hit at all. Of course, all that matters to me are the dividends. For many, index funds are the best way to go. Over time, the S&P 500 as always gone up. You’ve got to think of those funds as “gone” when you are still working; your spending power isn’t decreased when the market corrects because that money isn’t for spending! I’m actually sort of the opposite of you on the 401(k). Money deducted from my paycheck always felt like I never had it to begin with, while money I invested into my taxable brokerage (the dividend stocks) felt like it was being invested. I always saw those dividend stocks as my primary investment vehicle, while I’m primarily putting 25% of my paycheck into my 401(k) for tax purposes. I think a better question is, what did you invest in specifically that made you make money and February and March this year? Those were some tough months. Maybe a profession change from retail banking is in order? You can make big bucks outperforming the S&P. FANG is doing great… for now………. ARB, You were long on dividend paying stocks and you still had a mark-to-market loss even though no realized loss YET. It was an illusion that you had not taken a hit during that time. I don’t know about your investing horizon is two, three, ten or twenty years. I would be very careful about the assumption that the S&P always goes up. You would have had mark-to-market losses despite the dividends during the down months. You didn’t look at you P&L did not mean that you had not suffered from losses. You relied heavily on real estate with massive loans. I am glad it worked out because you had the right region. But without the FANG tech boom, the SF real eastate and it’s suroundings would not have gone up. The majority of real estate owners in the Midwest which now you like as an investment incurred up to 50% loss on paper on their houses. And the rental market was hard during that time. I think it is likely you would have sold down some of your real estate if you had been in St Louis or Kansas …. It is commendable that you recognize you are risk averse on stocks fluctuation. Yet you are quite a risk taker in real estate. You have not incurred a situation in which the Real Estate market you are in collapses instead of pulling back slightly. Would you have stayed the course on RE down 50% on paper? Some of us were forced to do so on our primary home because we did not want to default. But my $1M house is 2002 is now back to $1M today. But it was $$600k in 2010. Impossible to sell, short of paying the bank hundreds of thousands of dollars. Walking away and trashing my credit was not an option I considered acceptable. You said 13 years on the 2001 internet bubble. Well I got 16 years to get my money back on my RE. I am curious. It seems you would be willing to do it for RE but not for stocks. Absolutely. I bought a vacation property in Lake Tahoe in 2007 for 10% less than what the person paid a year ago. And then the property proceeded to decline by 40% in value or maybe more. It’s now just getting back to almost even. At the end of the day, it was a terrible investment. But, I have a lot of awesome memories and I can’t wait to take my son up there as I had dreamt 11 years ago. The property is now a really small portion of my net worth, so it is no longer hurts or matters. But that’s what happens over time. Btw, SF Was going up long before the tech boom. It’s beautiful out here. YouTube has a great interview with Warren Buffet where he shows the interviewer (can’t remember their name) some newspaper headlines he has framed in the hallway of his office at work. They all depict extremely difficult times in our nation’s history – be it war, stock market crashes, assassinations, etc… and those headlines remind him that those difficult times do pass and we find a way to better days (and higher market valuations). When times are difficult now, I try to think about Buffet and his newspaper articles to stay the course. Gotta appreciate Sam’s honestly, this is what sets him apart. It is true. In theory a lot more people are confident that they could weather the storm and not possibly fall for selling assets as the market crashes but until they go through it, it is just a mental exercise. The scary thing is as your net worth grows small dips in the market that would really have been peanuts early on in one’s investing career can create 5 figure losses in a day (I’ve had that a couple of times already this year). So far the largest single day loss (I can’t remember off hand, but I think it was in the 11-13k range) still didn’t cause me to panic and sell. I think my safety net is the passive income stream I have put a lot of effort building in (mainly in private syndicated properties) that allow not only for diversification from the volatility of the stock market but also provide a relatively nice floor of income (not that I need it now when I’m working but when I do pull the trigger and retire it will be very comforting). If you have passive income sources, I think you can be more tolerant of what the stock market does and not be prone to rash decisions. So you made more than $80K from October through Jan and then “lost” less than $50K in Feb and March and you can’t sleep at night? In my book you still made over $30K in about 8 months from the inception of your chart. You really shouldn’t be in the market if you can’t handle results like this. And if you take great comfort in the lack of volatility in that RealtyShares statement, you’re kidding yourself. RS just don’t mark their assets to market each month, otherwise there would be plenty of volatility there as well. You’re absolutely right that I have a low risk tolerance. But I do sleep pretty well at night, so I’m not sure where you got that idea. I’m just looking to understand my risk tolerance, help others understand their risk tolerance, and hopefully learn from those who’ve gotten all the finances down perfectly. I’d love to learn from you and how you structure your portfolio, where you see the economy, the stock market and real estate market going, and how much money and investment returns you think is enough. I really appreciate the criticism, but i’d also love to learn from you as well. I have seven other investment accounts to manage for my family. Thank you for your support and wisdom. PS I think the chart says I’m up about $104,000 since inception, or 12% since August 2017, not $30,000. The “can’t sleep well at night comment” was my short-hand for the several paragraphs you wrote stating you were “demotivated”, “depressed”, “regretful” and “scared”. Also, my comment was “$30K in about 8 months from inception” which is correct – beginning of August until end of March when the aforementioned afflictions made you “seriously reassess my risk tolerance”. My view is simple. While the market is volatile, it has always gone up over extended periods. Stay invested. Over time your portfolio value will increase despite the occasional correction or bear market. Your “passive income” coupled with the dividends provided by a portfolio invested in quality, dividend paying stocks will allow you to live more than comfortably for the rest of your life and still pass on a sizable estate to your heirs. The day-to-day value of your portfolio is irrelevant. The income that it generates is what matters. By the way, your dividend income will go up every year and will be taxed at favorable rates. Any capital gains can go completely untaxed by taking advantage of the step-up in basis upon your death. You will live well and create much greater wealth in the long-run if you stop fretting over your net worth every time it declines by a few percent over a short period of time. Got it. Glad I could clear the misunderstanding. Let’s forget about what the gains say in the chart. Can you share something about yourself to give me some prospective of where you are coming from? Theoretically, how would you invest 10 figures? I’m not the original poster, but I sort of agree with him/her. You are describing being regretful and scared in a scenario where you made money. A lot of it. Why do this to yourself if even when you’re winning you don’t feel good. A stressed parent is not a happy parent and, whether they go to work or not, a stressed parent is not an engaged parent in my opinion. I’m also working towards retirement, so I’m also looking at the stock market. This is our wealth allocation: 25% stock, 35% rental units, 25% our business in an unrelated field, 10% cash, 5% gold. This is what works for us at the moment. None of our stocks or cash is in our pension funds. I suppose the next 2-5 years will be a lot more difficult than the previous 5. Either stock markets will crash or there will be hyperinflation, well, I say hyper but I mean in the range of 5 to 10% per year (after all, all central banks printed money for 10 years like there was no tomorrow). There will be a lot more difficult to make money and to keep the money you have. But also, a lot of “free” money was made very easily in the last 5 years. We could sell our rentals to maybe 50% more than we bought them for. Whatever wealth gets destroyed in the next 5 years, maybe it wasn’t real in the first place and if we have to work harder in the future, maybe we did not have to work really hard in the past, no? Thanks. I’m not sure why I get worried when I lose a lot of money. This is something unique I may be discovering about myself. During the 2000 and 2008 downturn, were you investing money and feeling OK? What were some of the things you invested in and how did you manage to cope with those periods? I would love to learn how to be a better investor and invest big during down markets. Thanks for sharing your asset allocation. One of the Observations every time I post a investment related article is that the vast majority of people have no fear, and a great investors. Which makes me very bullish about America’s future. I was all of 17 during the 2000 downturn, so no big help there. I had just bough an apartment in 2008, with a (reasonable) mortgage, so I ate the loss in value full on. It didn’t bother me at the time, because I lived in the house. This is probably why I would not have a big problem with a 25 – 30% loss in value for our rentals now, mostly because our rent checks would still come in. Maybe we would have to lower the rents by 10-20% as well, but the thing is, we have enough money. We could trim the fat a bit. We could take one less vacation. We could spen 10-20% less than we do now and not have a significant drop in quality of life. We had a lot less and now we have a lot. I’m not afraid to go back to a little bit less. I’m resilient enough. And I think you shouldn’t be afraid either. I’m pretty sure you’re resilient enough. Good stuff. I think the key here is that you know your own self and your own risk tolerance by going through this mental exercise and seeing what you did. This is basically what I hope all readers do. Because our investment decisions are ours alone. I agree with you that it’s much easier to take a hit if it’s your primary residence because you’re just living in it. I purchased a house in 2009, a year out of college. Prices were still dropping, I had to put extra down because it was a “declining market.” I had a job, but it was with a small tech firm and I was last in the door, so who knew if my job or the company would last. Ultimately, I viewed it as a desirable area to live that should rebound eventually. Mortgage rates were low, so the ownership vs rental delta wasn’t bad. And I was sick of lousy landlords, so I viewed it as a quality of life thing. Unemployment was 10% or worse depending on metric. I figured I can out-think and out-hustle most people, so if it came to it I’d find something. Maybe something lousy, that paid awful and had a terrible boss, but I’d work through it, keep an eye on the exits, and the economy would get better eventually. Or if it didn’t, it didn’t. Can’t control that. If it all really fell apart, I’d be foreclosed on and that would be painful but join the line. I had summer jobs I kind of hated in high school (landscaping, cold calling…) but I still had nights and weekends to enjoy life on balance. I try to earn more, and save more, and spend less than most other people. I figure that’s in my control. I’m aiming to retire before most people do. If when it comes time, that’s 45 or 55 or 75, that’s what it is. I can be in the front of the herd, but if the herd runs off a cliff, the herd runs off a cliff. On balance, the good futures were more numerous than the bad futures. And while I didn’t want the bad futures, I’d still make the most of those lives. And you’re right, I’ll test this again next decline with more accumulated wealth on the line, but I suspect I’ll hold: I’ll worry some, but ultimately trust that things always turned back around before, and if they don’t this time at least I had a lot of good years among some future dark ones. The perspective from which I am coming is that of a lifelong investor who retired at 51 and has continued to invest the same before and after retirement. Sorry, I don’t have suggestions for how you should invest in terms of specific investments or asset allocation. I was offering my input on the subject of your post. You realize you’ve had the wind at your back with falling rates since ’81? And the Greenspan put since LTCM that made bonds and stocks positively correlated which is not the historical norm? You’ve ridden the K-wave Autumn and the heavily distorted Winter in which central banks have desperately fought financial asset deflation. While falling interest rates almost surely improve returns, you do realize that the market, including dividends, has gone up over every 10 year time span in its history (except for the 10 years ending in 1928). Investors have done well despite two world wars, the Great Depression, presidential assassinations, several extended periods of high inflation, a prime rate of 21.5% in 1980 following one of the most protracted periods of fed tightening in history (up from about 7% in 1970 during which time the S&P 500 was up 127% including dividends), terrorist attacks, etc. Essentially any rolling 10 year period in American history has been a good time to be invested. There was nothing particularly special about the period since 1981 as it relates to the authors post. Not sure how helpful it is to tell someone who has worry not to worry. That’s like telling someone with asthma just breathe bc there is so much air. Why not share some of your background as well? I see you have offered two critiques of the other’s posts without offering any advice yourself. I provided my recommendation along with my rationale. There is no need to be snarky and suggest that my post was useless. Perhaps you should provide your recommendation on how the author should proceed. How much did you retire with and how much money do you have invested now? Maybe your perspective is different because you have less or much more capital? It would help to get an idea if your numbers. I personally would be much more risk averse with $10,000,000 than with only $1,000,000 for example. Closer to 10 than 1. Invested 65% stock market, 25% Bonds (ST < 18 months), 10% conservative options fund. No real estate except primary residence. I'm not suggesting you get extremely aggressive, just maintain the investment style that got you to where you are. Having said that, over my investing lifetime I have gradually increased my exposure to the market as my net worth has increased. I did NOT decrease equity exposure as I neared retirement. Dividend and interest income puts us in the top 5% of US households in income. The dividend income is tax advantaged, so my effective income tax rate is lower that a wage earner with the same income. Investments in high quality, dividend paying stocks virtually insures our income will increase faster than the rate of inflation each year. Plus based on more than 100 years of history, I'll average 7% or so in market value growth per year. That's much better than pulling a significant portion out of the market and investing in 10 year treasuries at < 3% pre-tax which does not keep pace with inflation. You cannot spend the income AND grow the principal to offset inflation impacts with a 3% pre-tax return. At this point, I view our investments as generational wealth that I have the responsibility to grow. I have large capital gains that would be taxed (albeit at favorable rates) if I sell. My plan is to stay invested and have the estate take advantage of the step-up in basis on even greater capital gains when the time comes. I think many don’t realize that the GFC never ended. Forestalled by central bank balance sheet expansion it was. Now Mother Nature will not be denied. A Great Deleveraging awaits us. A Fourth Turning Kondratieff Winter that will go down in books as a culmination of a credit wave dating back to the founding of the Bank of England in 1694. I’ve been playing around with trading on crypto exchanges (I’m moving towards more traditional taxable accounts now, mostly on Robinhood) and it’s amazing how, in the span of a week, you can feel as if the price will never stop going up, to feeling as if the price will not stop dropping. It must be much harder when the drop lasts years or more. Time horizon is something that is not discussed enough among the personal finance nerds. Volatility and risk must be accepted if someone is seeking larger returns. If you are already drawing down on a portfolio of stocks or real estate you will have a different perspective then someone in the accumulation phase. In my mind losing money on paper one year and making a bunch the next is not that big of a deal. You have to make a plan and stick to it. Trying to always jump in and out of things I believe leads to lower returns and soooo much stress. I thought the market was going to drop big in 14,15,16,and 17! It’s hard to call the top and then enter again at the bottom. Thinking long term is really the key in my opinion. Simplicity I believe is also very beneficial. Easier to “stay the course” when you aren’t always stressing about random individual stocks, real estate, etc. For me if I lost 75% so what? It truly is all relative. That is an extreme case and people around the world suffer way worse then my paper loses. Also easy to handle loses when you grew up poor! Been a long time since I bought clothes at the Salvation Army with my single mom working 3 jobs to support me. Life is amazing and taking risk is necessary to move forward. No one is guratanteed anything in the future. That’s a great mindset to not care about losing 75%. Can you share what the most you’ve lost before in your net worth? As net worth is concerned I have lost up to 50%. This is college day trading thinking that I was going to make a fortune. Dollar amounts were less then what I am able to save/invest monthly at this point in time. I feel like I am actually a very conservative investor (indexing). If I lose 75% of my net worth that means the US economy is crushed. Those with leverage would be wiped out…so it’s all relative. I can’t claim I’m 100% equity at this point. I do have about 7% in fixed income and 2% cash in my actual portfolio. I still think if you don’t get bloated in your personal life downturns shouldn’t rattle you to bad. My mortgage is less then the average 2 bed apartment in Denver and I drive a 3k car. Staying lean and fighting lifestyle inflation! Good stuff. Lean is mean! Love that $3K car! Seriously, you got your money priorities in order. You being able to focus on relative wealth is very important. I’m sure it allows you to be much more appreciative of what you have. Have to stick to those FS rules for cars. It has been awesome to contribute more to investments each month then the cost of my car! There’s re-evaluating risk tolerance, and there’s trying to time markets. If you’re moving out of the market because a 1% real return is plenty to thrive in retirement on, that’s savvy. It’s savvy if you think the market is due for a correction, it’s even more savvy if you don’t. If you require 5% growth over some long span to meet your retirement goals, and you’re trying to ensure that by moving out before a predicted crash and back in afterwards, history suggests you’re just as well or better off holding tight. For anybody not yet financially independent, you can delay your retirement by being too aggressive, and also by being too conservative. I find it helpful to visualize the various futures I’m trading off. What will my life be like if the market returns 10% annualized and I continue seeing good promotions and raises, or a side business takes off to moderate success? What if markets return closer to 0, and I experience long bouts of unemployment? What about the middle ground? What about even more extreme outcomes? I think too many people fixate on one outcome as “the future” (good or bad depending on personality), but treating them all seriously has helped me understand my risk profile better. It also makes me appreciate what I have. Excellent article. As Mike Tyson said, “everyone has a plan until they get punched in the mouth.” A sharp stock drop feels like a punch in the mouth and can make long term plans change. I *think* I will buy when everything is down in the next downturn but yeah you’re right it could be much harder than I anticipate. I didn’t buy any significant amounts from in the past meltdowns so I may not have the guts the next time. I hope to try though. Definitely a stronger correlation on the downside for me. I get more anxious for sure. This is a very timely piece. Although most of my portfolio is doing well, I took an outsized risk on a speculative stock over the last month. It was doing fantastic until recently when it took a beating and I not only lost my earnings, but a good chunk of my initial investment as well. Sick to my stomach. Beating myself up about not exiting. Hard to focus at work. Etc. And worst thing is, I know better. I too lived through 2000 and 2008 calamities. In both cases, I got over-exposed and a little too bullish. You know, I’ve been through two bad markets now and barely paid attention. I knew I was losing money but just figured it would come back up. I did sell during the tech crash but that was because my advisor told me to. I would have been far ahead if I had hung on. For me, the best antidote for a bad market is twofold. Match the market with diversification. Have a strong W2 or side hustle income. We’ll see if I can stomach it once I slow down at work. You are correct, if you have a W2 for cash flow purposes, it is a lot easier to not worry about the principal in the investment account to go down. I am guessing Sam being an entrepreneur without a W2 in 2013 on would not be as comfortable. I sure would not. I’ve been through ups and downs so I know my tolerance. But the answer isn’t change course regardless. If your current perception of risk causes you to change your course then you didn’t follow the correct allocation for your tolerance in the first place. The amount differs for anyone. That all being said I agree the average young person has no clue what their tolerance is. These are the folks espousing 100 percent stocks. I don’t believe you can truly know your tolerance until a downturn. But you can simulate it for some of the effect. Simply without looking at your numbers or following the market tell someone to give you portfolio numbers each day for a month. Tell them to insert randomly a major market drop in their but not tell you if it’s real or not. Then see how you react. If the first thing you do is flip out and check if the number is real, you are not set to the right tolerance. Or you could just invest through the dotcom and 2008 crashes. Sam’s whole point is that whatever you structure your portfolio to be based on your wrist tolerance, it won’t be accurate until you start losing a lot of money. I agree with Sam’s thesis. And if you are still working with lots of time to recuperate your losses, then maybe your risk tolerance is higher. But for those of us who don’t wanna work and waste our lives, our risk tolerance is lower. I luv how everybody assumes time will heal investing mistakes. There are such things as secular bear markets that encompass much of a investing career. The next one could be one for the ages. Good perspective Sam. I was new to investing in 2000-02 (I was 34 then), and took a big hit watching my tech stocks evaporate, and the invincible Cisco dive hard. By 2008-09, I was self-employed, own a house and a rental property and foresaw the crash. Really. I had about $60K invested in bank stocks, which was a big percentage of my portfolio at the time, and sold all of them a week before the crash based on an article I had just read. The problem was, I was convinced the entire economy was a house of cards and a new storm was coming in fast. I mostly stayed out of the market for the next 7 or 8 years and missed the recovery. I concentrated mostly on my business, which grew six-fold since 2010 with strong financials, saving cash and paying down debt. My overall position is good, but I am still deeply suspicious of the juiced market, and the zero-interest-rate policy. I wonder what my position would be had I “stay the course” and I think my risk tolerance is fairly low meaning that when there is a significant downturn, I might flee to cash again. Entrepreneurs or self-employed people have a slightly different mindset than a day job worker. We carry more risk because everything is on our shoulders, especially if our spouse is not working. But we also are a little better at controlling our destiny, or so we think because we are not at the whims of someone else’s discretion. Congrats on a 6 bagger with your business! Thought provoking article Sam. I would say that investors young enough to only experience the market rising will discover what their risk tolerance is soon. I started investing in the late 90s and FOMO on the tech sector caused me to lose about 30% of my investment. I locked in my loss and learned a couple lessons about diversity and valuations. When 2008 came and I saw a 37% decline in my portfolio, I continued to rebalance on schedule, rode out the downturn and was back to even in less than a year. Unfortunately, a coworker learned his risk tolerance was lower than he thought and locked in huge losses in his 401K by selling his stock funds and moving to government securities. It’s amazing to see Bitcoin and all the cryptos get pummeled compared to December 2017. Easy come, easy go. 2000-2 was hard to keep investing into because lots of companies were going out of business and the declines were so long. Look at a long term chart of amazon, and tell me if you could keep buying at that time? No one did which is why you rarely hear of investing success stories from that recession. This was before indexing was popular so was hard to pick and choose your shots. 2008-9 was absolutely brutal. Daily portfolio declines equivalent to months of income/spending. It was so hard to invest in anything not set/forget like a 401k. My hope is that next time won’t be a bad one like these and that we have a nice buying/rebalancing opportunity… who knows though. I still do feel the same way after this post but with a different appreciation and awareness. But this is also based on my personal circumstances in terms of time (I’m 33), responsibilities (married – Mrs. BD has a job in a relatively stable industry – with no kids), and potential cushioning (no debt of any kind & ~6 months of cash in the bank). Your points raised about saving money in a tax-deferred vehicle vs. additional quantities in a taxable account also stuck out. About 92% of our net worth is currently in retirement accounts; we only began increasing excess capital to non-taxable accounts the last 2-3 years (primarily due to increases in income but also a personal shift in mindset after a close encounter with debt when we realized we had little to no savings besides retirement). Sam thanks for ur transparency. Ur introspection and willing to share ur thoughts about the downside is much appreciated. I’m 33 y/o making ~$300k/yr planning to retire in 4.5 years. Currently have $730k net worth with 70% in equities. I plan on leaving it “as is” while saving up a cash pile to allow me to buy stocks or real estate when it dips. Hoping the recession hits and is over before I retire at the end of 2022! Hmmm, with that strategy it may be tough if you really plan to retire in 4.5 years! Let’s say the recession hits in 2019-2020. You’ll likely lose about 20% – 30%, at which point, you’re gonna tell yourself, “I’m just 35-36 years old, let’s extend my retirement date by a coupole more years just to make back the money and then some.” You also won’t want to part with your cash b/c of your investment losses, fear of the unknown, and impending reitrement. What if the markets correct further? It’s tough to know. Bulking up on cash now isn’t a bad idea. Spot on. I’m committed to taking your advice of choosing a year to retire rather than waiting for XYZ financial situation to appear. Most important to me is retiring at age 38 so that I can be a stay at home parent with my wife (the plan is to have 1 child before I retire and 2 more once I’m retired). Your site has helped me to think about generating income in addition to net worth so that income can fund my lifestyle and minimize principal reduction. We live pretty modestly in CO so this should be doable. Typical annual spend now is ~$50k with 1/2 of that going to rent. We would like to purchase a smaller home/condo; just doing our research now and making sure we make a good decision. It’s incredible to see the economics of renting vs owning – on a monthly cash flow basis, based on the scenarios we’re considering, it’s cheaper to own… Lots to think about. Thanks again for continuing to inspire and educate us. I’ve been reading your blog for the past ~6 years and hope to be reading for another 50+ years. Keep the good content coming. When I left into thousand and 12, it was kind of that scenario you described. Every year since I left the stock and RE markets have been strong, so there hasn’t been too much pressure too go back to work. So I figure, after six years, I’m going to cash in my chips and be more conservative, especially now that I can get a higher guaranteed income with higher rates. This mirrors my outlook. I sat on dead capital from 2007 to 2011 only to break even over the period. If I only stayed on board it would have more than doubled by now. So true that it is all fun and games until it goes down, way-down. I honestly do not believe that I have tested my personal risk tolerance to the max. Great post! Greed and fear are strong emotions. I try to focus on what’s working, When there is a hard sell off on stocks I say wow my bond ladder looks great:) investing is a total mind game. I’ve been through volatile periods and it’s horrible. I measure my proceeds in USD so I have a currency aspect too and my local currency is volatile to say the least – 6% networth movements in a month because of currency. Very good points Sam, it’s all fun and games until your numbers start going way down, then it gets real. I’m no guru but I did survive 2000 being slightly older than you were at the time, as well as 2008 without selling. I’m confident I can survive the next one without panicking. But I know it won’t feel good, and it will no doubt make me question some things in my head from time to time. Ultimately you have to ignore what your friends are doing and what other people are doing, and although it sounds corny, have faith in America and the amazing engine that the stock market is. It will survive, and come back.